Elizabeth Peacock. Photo by Pa Moua-Yang. University Communications. Stories of immigration are important to ethnic communities, in that they help people identify with each other through their shared experiences of leaving the homeland, adjusting to the new land, and learning how to retain their culture throughout this process. These stories are also important, however, as they are often used to teach the next generation about their culture and why it is important to retain their ethnic identity. In her talk, Dr. Peacock will present family stories of immigration, as told to her by the children and grandchildren of Ukrainian-Americans. Through these stories, she will highlight the elements that are of central importance to the story of Ukrainian immigration among the Chicago Ukrainian-American community, and discuss how these immigration narratives may influence the relations between Ukrainian-Americans and more recent immigrants from Ukraine. 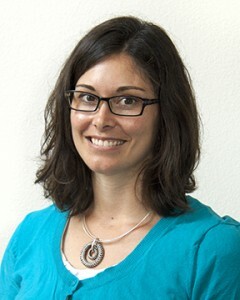 Dr. Elizabeth Peacock is an anthropologist and Assistant Professor in the Department of Archaeology and Anthropology at the University of Wisconsin- La Crosse. She has conducted research on issues of identity, language, and place among young people in L’viv since 2004, and is planning another trip to L’viv this summer. Her second project looks at issues of ethnic identity among young Ukrainian-Americans and young recent immigrants from Ukraine, and has been on-going since 2014. If you are aged 14-30 and identify as a Ukrainian immigrant, or are the child or grandchild of immigrants from Ukraine, and are interested in participating in this project, please contact Dr. Peacock at epeacock@uwlax.edu.